Susie Marin is a young-at-heart music educator with over 23 years teaching experience. She is a Southern California native having grown up just outside of Los Angeles. She earned her Bachelors in Music Education from Cal State Fullerton, her Credential from Azusa Pacific University, and a Masters in Instrumental Conducting from Southern Oregon University and the American Band College. She has taught in Long Beach Unified and Azusa Unified School Districts. 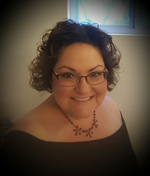 She has been the Director of Bands at Azusa High School for 21 years while simultaneously serving as the district music coordinator and overseeing the music programs k-12. Under her leadership the Azusa High Bands earned numerous Unanimous Superiors at SCSBOA District Festivals and Jazz Festivals. On the field her bands have been recognized for creative and musical performances; having earned 3 SCSBOA Field Championships and numerous high caption awards for Visual Effect and Performance. She has traveled with her students and performed throughout Europe as part of the Voyagers Tour. Susie serves on the SCSBOA Field Adjudication Steering Committee and is an SCSBOA Festival and Field Adjudicator. She believes learning is life long and regularly attends workshops and conferences so she may better serve her students. She has been recognized for her commitment to her students and the community of Azusa with a Teacher of the Year Award and the Teachers Honoring Excellence Award. She believes in building relationships with students and parents through music. Through commitment to excellence and pride in their program students develop lifelong skills that help them grow into creative, responsible, and productive members of society. Susie is married to Bill Martinez her college sweet heart. They both play saxophone and are music educators and are the parents of two feline fur babies Jack and Wilbur. Bryan Nungaray is currently one of the most active educators in the realm of marching percussion, assuming the role of both instructor and arranger for several groups in the Southern California region, such as the 2016 SCPA Percussion Scholastic Open Gold Medalist, Etiwanda High School from Rancho Cucamonga, CA, and the 2015 WBA Grand Champions with High Percussion, Ayala High School from Chino Hills, CA. His performance experience extends back to his participation with the Mission Viejo High School Percussion Ensemble, where he played tenors with the Indoor Percussion ensemble, as well as mallet percussion for the Concert Indoor Percussion Ensemble under the instruction of Mike Jackson and Jim Wunderlich. Both groups earned immense praise, earning the 2004 WGI Percussion Scholastic World Silver Medal and Percussion Scholastic Concert Open Gold Medal – along with the 2005 WGI Percussion Scholastic Concert World Silver Medal. 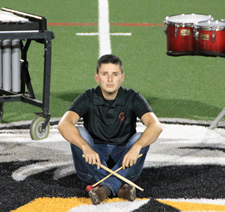 Following high school, Bryan also participated with the world-renown Riverside Community College Marching Tigers as a mallet player, as well as participating with Impulse Drum and Bugle Corps during the summer. Bryan's instructing/arranging career has brought about numerous accolades in a short amount of time, as his first year with Ayala High School earned the ensemble an unprecedented Scholastic World Class sweep at the 2010 Winter Guard International World Championships – earning gold medals in the PSW and PSCW categories and the 2009 WBA High Percussion trophy in the 4A/5A classification. His high school ensembles regularly compete in other well-known circuits, such as Bands of America (BOA), the Western Band Association (WBA), the Southern California School Band and Orchestra Association (SCSBOA), the Southern California Percussion Alliance (SCPA), and Winter Guard International (WGI). Year after year his programs remain a top contender within each circuit. He is currently the Percussion Director for Etiwanda High School in Rancho Cucamonga, CA – maintaining a busy schedule that is not solely limited to instructing, but arranging for several groups as well. Among them: Academy Drum & Bugle Corp in Tempe, AZ, Gold Drum & Bugle Corps in Oceanside, CA, Velvet Knights Drum & Bugle Corp in Pasadena, CA, Cypress High School in Cypress, CA, Arroyo High School in El Monte, CA, Loara High School in Anaheim, CA, Granada Hills High School in Sherman Oaks, CA, Cesar Chavez HS in Delano, CA, and Robert F. Kennedy High School in Delano, CA, Hanna High School in Brownsville, TX, Hancock High School in Kiln, MS, and Stryke Percussion A from Hollywood, FL. Bryan is a proud endorser of Remo and also endorses Innovative Percussion. He currently resides in Chino Hills, CA.